Maggie Kervick said she sold so many handbags at school that year she didn’t have to look for a job that summer. Then she took a course in accessory design at Fashion Institute of Technology in New York, where she learned new techniques to make them look more professional. 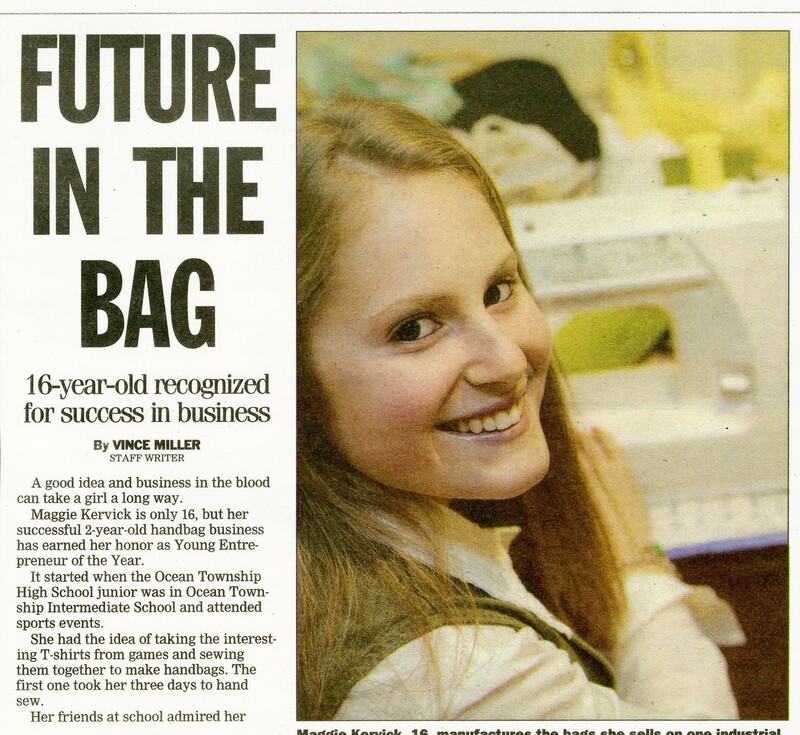 I learned so much and met some incredibly talented people,” she said, “I hope to enroll at FIT after graduating high school.” In considering a name for her new business, the younger Kervick thought of Baggys by Maggie and MK Bags. But the name that stuck was bags By Mags, which she operates from home in the Wayside section of Ocean Township. New Jersey Association of Womens Business Owners honored Maggie Kervick as its top young entrepreneur at a banquet Jan. 26. Jim Kervick said his daughter is a natural. On trips to New York, she has impressed merchants so much so , they often would sell her fabric at discount prices”, he said, “one merchant sold her $300 worth of handbag straps for $30. “She’s incredibly focused and disciplined,” Jim Kervick said. he said his daughter may have inherited some of her creative flair from his late mother. She decorated the window of Lord & Taylor and Bloomingdale’s stores in Manhattan. 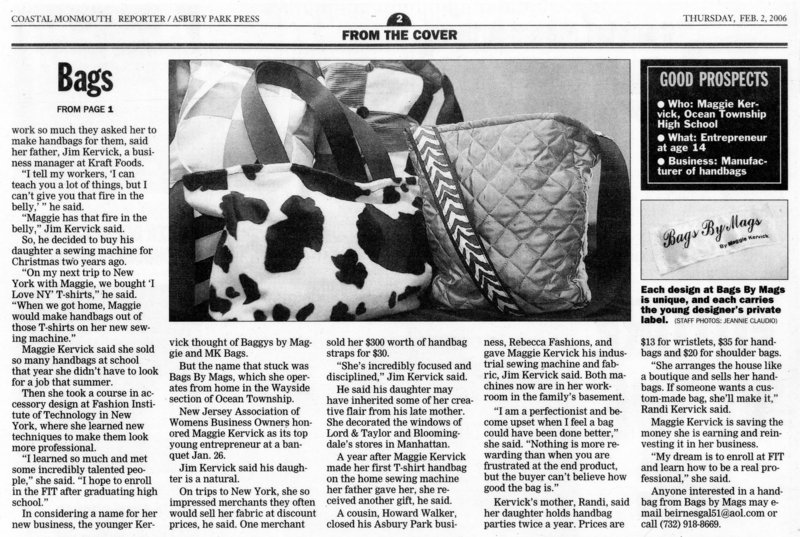 “A year after Maggie Kervick made her first T-shirt handbag on the home sewing machine her father gave her, she received another gift”, he said. “A cousin, Howard Walter, closed his Asbury Park business, Rebecca Fashions, and gave Maggie Kervick his industrial sewing machine and fabric”, Jim Kervick said. Both machines now are in her work room in the family’s basement. “I am a perfectionist and become upset when I feel a bag could have been done better,” she said, “Nothing is more rewarding than when you are frustrated at the end product, but the buyer can’t believe how good the bag is.” Kervick’s mother, Randi, said her daughter holds handbag parties twice a year. Prices are $13 for wristlets, $35 for handbags and $20 for shoulder bags. “She arranges the house like a boutique and sells her handbags. If someone wants a custom-made bag, she’ll make it,” Randi Kervick said. Maggie kervick is saving the money she is earning and reinvesting it in her business. “My dream is to enroll at FIT and learn how to be a real professional,” she said. Anyone interested in a handbag from Bags By Mags may e-mail beirnesgal51@aol.com or call (732)918-8669.